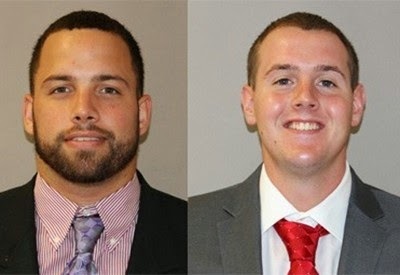 ANNVILLE, Pa. -- Albright College junior linebacker Steve Barroso was named the Middle Atlantic Conference Defensive Player of the Week and junior kicker Daniel Sobolewski was named the Special Teams Player of the Week the conference office announced on Sunday. Barroso earned his second Defensive Player of the Week honor after also capturing the award on Sept. 28 and it marked the first time that Sobolewski has been honored this season. Barroso had nine tackles, 2.0 tackles for loss, an interception and a pass broken up in the Lions 30-24 double-overtime victory over King's on Saturday. He had two big plays that helped contribute to the Albright victory. With King's driving for a go-ahead score early in the third quarter Barroso intercepted a pass at the Albright 13-yard line helping the Lions protect a slim 7-2 lead. And in the second overtime with King's facing a 4th-and-2 on the Albright 5-yard line Barroso made the tackle stopping the runner short of the first down marker. Sobolewski had a brilliant afternoon kicking the ball for the Lions. His day was headlined by drilling a school-record 52-yard field goal in the second quarter, which broke his own school record of 51 yards set last season against Stevenson. He also averaged 42.5 yards on two punts and pinned one inside the 20-yard line. Additionally, he averaged 66.4 on five kickoffs and recorded two touchbacks, which included an 80-yard kickoff for a touchback following a King's safety. This marks the third time that an Albright player has won the conference Special Teams Player of the Week award and the third time that a Lion has been named the Defensive Player of the Week. Albright will return to action on Saturday (Nov. 1) when it visits Wilkes for a Middle Atlantic Conference game scheduled for a 1 p.m. kickoff.